A complex painting with interesting abstract shapes and reflections. 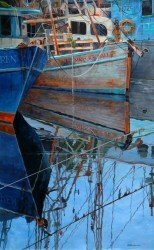 This mix of abstract and realism features several shrimp boats laced together to make patterns of light and shade. The weather worn character of these old boats helps to set the colorful tone of the piece.